Earlier this week, as part of its daily book review slot on the Nine to Noon programme, Radio New Zealand addressed Australian author Michael Robotham's latest thriller, BLEED FOR ME, released in New Zealand this month. One of the great things about the Nine to Noon show, hosted by Kathryn Ryan - who also regularly does interviews with New Zealand and visiting authors - is that they do semi-regularly cover some crime and thriller titles. They're also fascinating reviews to listen to, because rather than being just a print review of a reviewer's thoughts, Ryan 'interviews' the reviewer, and asks them questions about the book, drawing out comments. So it's more of a dialogue, than a monologue - which is a nice change of pace. Today the reviewer was Emma Hart, who unfortunately didn't start too well when she assertively said Robotham was a Brit now living in the UK, so that's why he set his book in Bath (Robotham is in fact a born and bred Australian, who after spending his first 20+ years in Australia, travelled overseas and worked in a variety of places, including the UK, as a journalist). However the rest of the review was quite good, and very positive about the book. "This is fantastically written," says Hart. You can listen to the full 7 and a half minute review of BLEED FOR ME here. 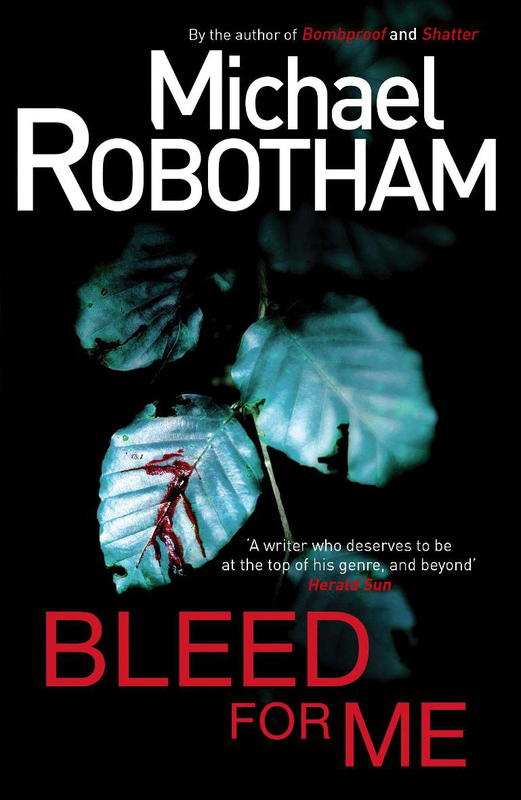 I have recently read BLEED FOR ME, and really enjoyed my first taste of Robotham's writing. I have a couple of reviews of the book coming out in New Zealand and overseas publications in future, so I will link to them as and when they're available. Have you read BLEED FOR ME or any of Michael Robotham's earlier books? What do you think? What do you think of the Hart's review? Does BLEED FOR ME sound like something you might enjoy? Thoughts and comments welcome. Craig - I've not yet read Bleed For Me. I do like Robotham's work though, and this one's on my TBR list. I've read four of Robotham's books - enjoyed the first two, disliked the 3rd and as a bit ho hum about the 4th - Shatter - which most people speak highly of. To me he creates great characters (I adore Joe) but falls down a bit on story telling. With Shatter there was this one big plot point that was supposed to be really terrifying but it wasn't (to me) but because the rest of the plot hung off the fact that I was supposed to have been shocked by the original thing I spent most of the time just wishing he'd get on with it. I'll probably read Bleed for Me eventually because I like Joe (and Michael Robotham too who seems like a genuinely nice bloke). I listened to the review and am afraid I couldn't get past the fact that neither of them bothered to spend even 60 seconds Googling anything about Robotham - his nationality and the number of books he has written are not exactly state secrets (all right there on his website) and it can't have been a shock to the reviewer to have been asked such basic questions. That kind of unpreparedness really (really) bugs me. But you're right - it's a good format for a review. I've not read Robotham's books yet, but will give them a try. Thanks for your information. Good points Bernadette. It was unusually lazy (in terms of background research) for a Radio NZ and Kathryn Ryan programme - their standards are generally higher. Graham Beattie often reviews for them, and his reviews are top quality. I have read the first two. I liked both of them but preferred the first because there was a conspiracy in the second. Very well done, but not my kind of plot.